Ebony Steele – Rickey Smiley Morning Show Co-host, Susan G. Komen for the Cure Circle of Promise Ambassador and one of five Survivor Ambassadors for General Mills’ Pink Together campaign – will host a special event for breast cancer awareness in Atlanta on October 28. Eye Candy: Bare Chest for Breast Cancer will feature Atlanta’s most delicious male models, all in the name of charity! From athletes to actors, students to entrepreneurs, Atlanta’s most handsome will rip the runway all in the name of breast cancer awareness. 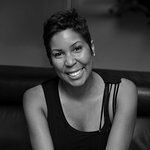 Proceeds from BARE CHEST FOR BREAST CANCER will benefit Susan G. Komen Circle of Promise for whom Ebony is a national ambassador alongside Gabrielle Union, Rene’ Syler, and Richard Roundtree. Ebony is also featured this month as a survivor on Cheerios, Hamburger Helper, and other General Mills products, and has been highlighting survivors daily on the nationally syndicated Rickey Smiley Morning Show. The event takes place at Club Opera, 1150 B Crescent Avenue, Atlanta at 8pm on Thursday.